Little, Brown Books for Young Readers, 9780316466776, 40pp. The fourth book in the New York Times-bestselling Magnolia Says DON'T! series that started with If You Ever Want to Bring an Alligator to School, Don't! is another loud and cautionary tale of what not to do...when you visit Santa. If your dad says you're going to meet a bearded guy with a red suit and a bag full of treasures...he is not talking about meeting a pirate! But Magnolia has already invited the misbehaving swashbuckler to jump in line to meet Santa. So what if pirates are on the Naughty List? She'll just teach this one to change his scurvy ways--no plundering or sword-fighting or plank-walking allowed! Plus, Santa is happy to hear everyone's wish list. Right? 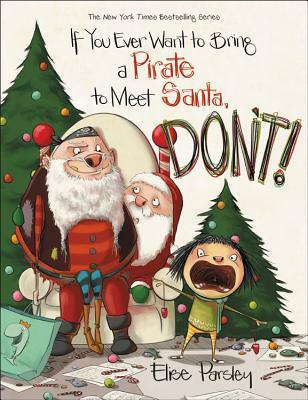 It's YO HO HO versus HO HO HO in this rowdy and raucous holiday guide on how not to meet Santa, from Elise Parsley, the bestselling creator of If You Ever Want to Bring an Alligator to School, DON'T! Elise Parsley wrote and illustrated the bestselling If You Ever Want to Bring an Alligator to School, Don't!, which was her debut picture book. She has also written and illustrated If You Ever Want to Bring a Piano to the Beach, Don't!, If You Ever Want to Bring a Circus to the Library, Don't!, Neck & Neck, and illustrated The Magic Word by Mac Barnett. She lives in South Dakota with her husband. "An enthusiastic heroine buddies up with a pirate while waiting to see Santa.... Readers should appreciate that the pirate's moment of redemption is quickly eclipsed by his undeniably naughty nature." "Good fun to read aloud." "Spunky little Magnolia continues to push rules to the limit.... Offers a fun way to address proper library behavior without ignoring the joy books can bring." "Magnolia's voice is wonderfully childlike...but her facial expressions top all, perfectly capturing both her exuberance and her mood swings." "Brim[s] with energy and just-edgy-enough humor...and the well-chosen school-day details in both the artwork and text...deliver a steady stream of laughs."